Hamilton Square's been back in the news this week. The works there have exposed some of the fine Victorian tile work - which will sadly be covered up again with new cladding - and also a load of old posters. Many of these seem to be from the 50s and 60s. (It would be remiss of me not to point out the one that says New Brighton is "gay"). You can view an excellent gallery of the rediscovered posters at the Echo website - here. Or, if you'd prefer, here's a badly filmed video of the station done by me through a train window yesterday. Please send my Oscar to the usual address. The continuing closure of the station has resulted in a new, temporary version of the Merseyrail map. My heart sinks just typing those words. Merseytravel produce some fine display materials and some excellent posters, but for some reason, when it comes to the network map, they always fail. It's as though they assign the work experience boy to those jobs, even though the map is one of the most important pieces of artwork they produce. The closure of Hamilton Square is more inconvenient to passengers than the closure of one of the Liverpool underground stations. Hamilton Square is at the heart of its own district, separate to the rest of Birkenhead. There are Council offices, the Wirral's Magistrates Court, a police station. A significant legal centre has grown up in the area. There's a college nearby, not to mention the bus and ferry termini at Woodside. In addition, Hamilton Square is the point where the Wirral Line splits north to the New Brighton and West Kirby lines and south to the Chester and Ellesmere Port lines. Merseytravel have provided a bus service which travels between Conway Park (on the West Kirby line), Birkenhead Central (on the Chester line) and the Hamilton Square district to enable as many journeys as possible to continue uninterrupted. The Merseyrail map needed to be adjusted to show both the closure of Hamilton Square and the alternative bus service. This is how they did it. That's not right. In fact, that's so wrong, it actually hurts. Here's a few basic rules of railway map design. A solid line indicates a regular service. A broken line shows an irregular or interrupted service. A circle indicates an interchange between train services. These are rules that have been established, at least since Harry Beck's Tube diagram in 1931, and probably before. This map violates those rules. 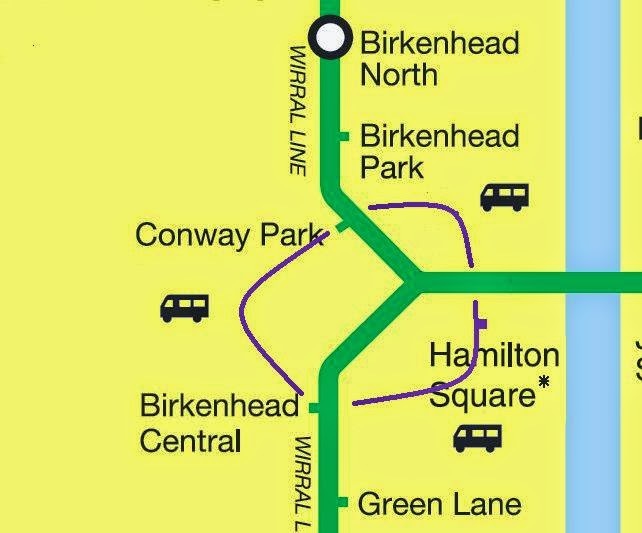 The broken lines seem to say that Wirral Line services terminate at one of the three stations in Birkenhead town centre: Hamilton Square, Conway Park, or Birkenhead Central. The broken lines hint at their former paths, but, for some reason, they can't go that way. Your journey will be inconvenienced in some way. The new map implies that there was a direct Conway Park-Birkenhead Central service, which there wasn't. And Hamilton Square has exactly the same symbol as the open interchange stations. Yes, there's a big green box at the bottom of the map saying Hamilton Square is closed. But it's at the bottom of the map. It's near Chester, in the spot that used to tell you about the bus service into Chester city centre. It's not near Hamilton Square. There's not even an asterisk on Hamilton Square to show that there might be something unusual going on. It's abundantly clear what's happened there. The brown Bakerloo and black Northern lines continue uninterrupted to Waterloo from Charing Cross. The District and Circle lines at Embankment (which remain open) are still on the map. And a dagger next to the Embankment station name shows you that there is something unusual about that station, and so you should refer to the box at the bottom for further information. It's simple. In fact, Merseytravel had it even simpler, because they didn't have the complication of only half the station being open. Yet they managed to hash it up quite royally. Here's what I would have done. Now bear in mind: all I have to work with is MS Paint and my own clunky fists. I don't have access to Photoshop and years of training and artistic skill. So this is the best I could come up with, but it shows the principle. The Wirral Line remains unmolested, so you can still take a train straight into Liverpool city centre. Hamilton Square's circle is removed from the line completely, and an asterisk guides you to a key at the bottom of the map. And the purple line shows the bus services, including the stop at Hamilton Square. 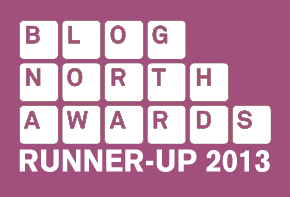 It's not perfect, of course - I had to get rid of the large BIRKENHEAD caption, and the purple line shouldn't go through the station name - but I repeat: I am not a trained graphic designer. That revision shows there's something odd going on but most of your train journeys will be unaffected, and there's a bus route for those you who are affected. (You could possibly add the ferry in as well, given that it effectively replicates the James Street-Hamilton Square portion of the line, but that would probably be over egging the pudding). It's not difficult. It just requires a little bit of thought from the designers at Mann Island. They need to put themselves in the mind of an infrequent traveller, a foreign tourist who wants to get from Liverpool to Chester to visit the Walls and wants to know the quickest, easiest way of doing it. I'd be put off travelling on the Wirral Line by that dotted section if I didn't know better. It hints at hassle that doesn't exist. You'll be thrilled to know that Embankment station was reconnected to the Northern line last month. That's really bad: the map as issued clearly implies that Hamilton Square is open but that your journey from James street to one of the Birkenheads beyond it will be disrupted. Two massive fails. Whoever "designed" this should literally be dismissed from their job as incompetent. I hope you've complained formally. ... with a key at the bottom of the map describing the nature of the rail replacement buses.